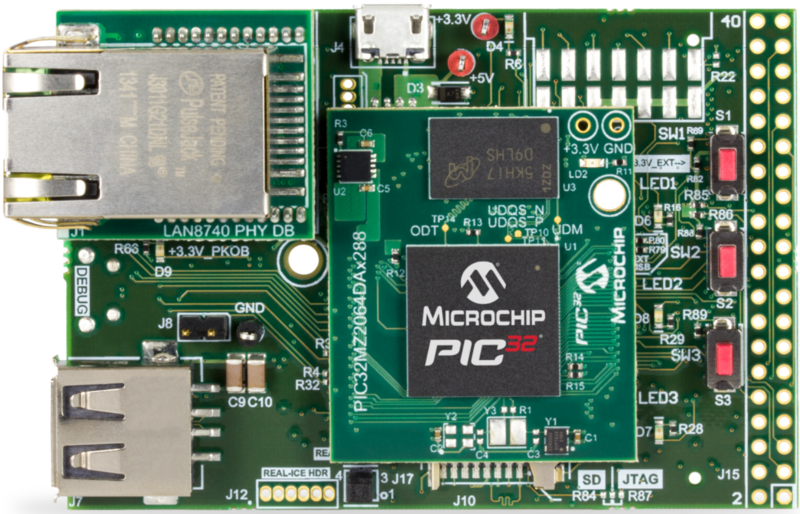 The PIC32MZ Embedded Graphics with External DRAM (DA) Starter Kit provides a low-cost method for the development and testing of graphics applications with PIC32MZ DA family devices. It can be used as a stand-alone board or mounted onto the Multimedia Expansion Board II or PIC32 I/O Expansion Board. It can also be mounted on a Raspberry Pi using the 2x20 header on the edge of the board. Demonstration projects for this board are included in the MPLAB® Harmony Integrated Software Framework. The PIC32MZ Embedded Graphics with External DRAM (DA) Starter Kit uses PIC32MZ2064DAA288. The PIC32MZ Embedded Graphics with External DRAM (DA) Starter Kit (Crypto) uses PIC32MZ2064DAB288. The RJ-11 to ICSP Adapter 2 Board has a 0.050" (50 mil) pitch header. This can be used to connect a faster programmer/debugger (e.g., MPLAB® ICD4 or MPLAB Real ICE) to this starter kit. All example projects included in the MPLAB Harmony software framework are documented in the "Harmony Help" file under "Volume I: Applications Help". To find all projects that use this specific board, search the "Harmony Help" file for pic32mz_da_sk_extddr. This is the name of the board support package (BSP) assigned to this development board. There are 14 example Harmony projects that use this starter kit in Harmony version 2.05.01.